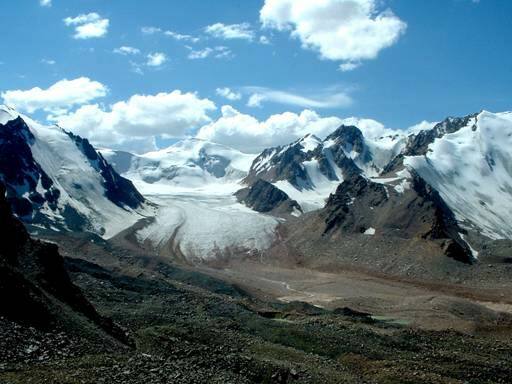 Central Asian glaciers: Tian Shan and Pamir and other high mountain regions of Kyrgyzstan, Kazakhstan, Tajikistan, and Uzbekistan serve as water towers by providing a continuous supply of fresh water to the lowlands, thereby allowing economic activity to take place. Their recession over the past few decades in response to global climate change is striking. Central Asia is included in water-stressed areas where projected climate change could further decrease stream flow and ground water recharge. Several studies show that glaciers in the region are melting very rapidly, losing about 1.0% of their volume per year between 1955-2000. Over this time the glaciers’ total surface area declined from 70,000 to 45,000 square kilometers. 4.	identify the most pressing research needs and develop a plan of regional activities including strong linkages with donors. The workshop will contribute toward national, sub-regional and regional requirements for systematic climatic observation to support national planning for adaptation to climate variability, and climate-driven changes in the water resources system. The workshop will aim to identify an organizational structure of a regional research network on the hydrological impacts of glaciers and snow cover.